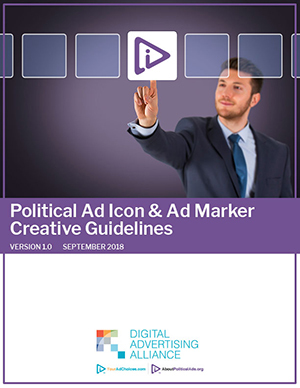 The Digital Advertising Alliance’s (DAA) Political Ad icon and associated ad marker is the visual representation of a link presented to users to learn more about the political ad they are currently viewing. Consistent and proper usage of the Political Ad icon and ad marker will reinforce the application of consumer-friendly standards for transparency across the Internet. In addition to these creative guidelines, please download the Application of the Self-Regulatory Principles of Transparency & Accountability to Political Advertising. This guidance responds to the growing use of digital advertising platforms and technologies to reach potential audiences with political advertising and creates new tools to provide greater transparency and accountability to such emerging practices. To whom does this information apply? Agencies responsible for the development of digital ad creative. Creative agencies can use the following specifications for placing elements that are important for brand recognition and/or ad functionality.